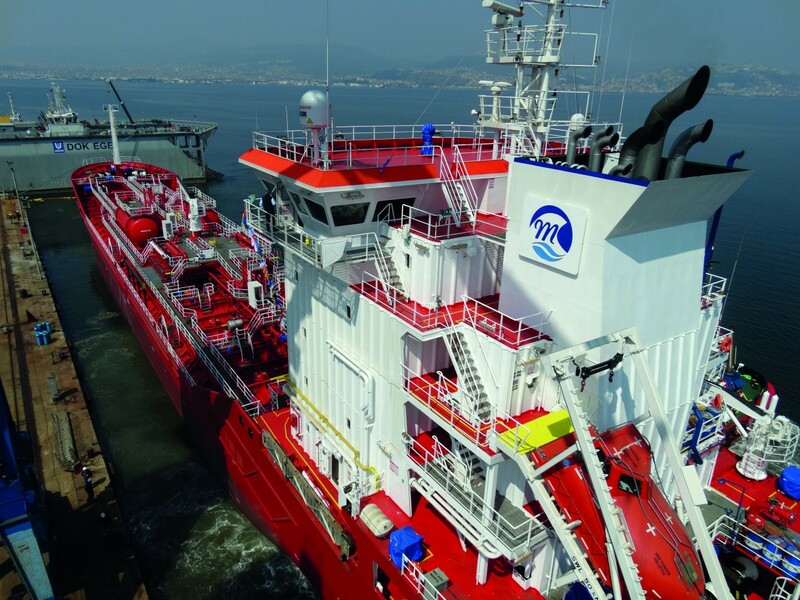 Newly-built 8400DWT chemical tanker Med Tuncer has joined YMN Tanker’s management on 5th of April, 2019. She was successfully launched in Atlas Shipyard on July 17, 2018. Her sister, Med Antarctic, was launched on March 2017 and went under YMN Tanker’s management on August 2017. Med Tuncer (project name NB08) is an 8400DWT chemical/oil tanker measuring 123,9m x 17,2m. She is powered by a powerful MAK/8M32C main engine developing 4000 KW at 600 rpm. Med Tuncer is equipped with ZF CP KH-1200 propeller rating 4000Kw at 600 rpm with the diameter of 4500 mm. The propeller is of 4-bladed type, made of Nickel-Aluminium-Bronze and controllable pitch type. One AVK synchronous three phase reversible machine - 1499kVA as shaft alternator with following features is installed: 1400kWe as e-motor, 4P, B3 or B20, 3 phase, 450V, 60Hz, 1800rpm, IP23, insulation class H, temp. rise class H.
Auxiliary electric generator set consists of three pieces around 585 kW, 31.25Kva at p.f.0,8, 3x450V, 60Hz, 1800 rpm. 12 pcs FRAMO hydraulically driven, single stage, submerged deepwell pump, type SD 150, with the capacity 350 m3/h at 110 mlc, gravity 0.8 t/m3 and viscosity 1.0 cst are installed for cargo tanks. Additionally, 2 pcs FRAMO hydraulically driven submerged deepwell pump, type SD 100, are supplied for slop tank with 100 m3/h at 110 mlc, gravity 0.8 t/m3 and viscosity 1.0 cst capacity. 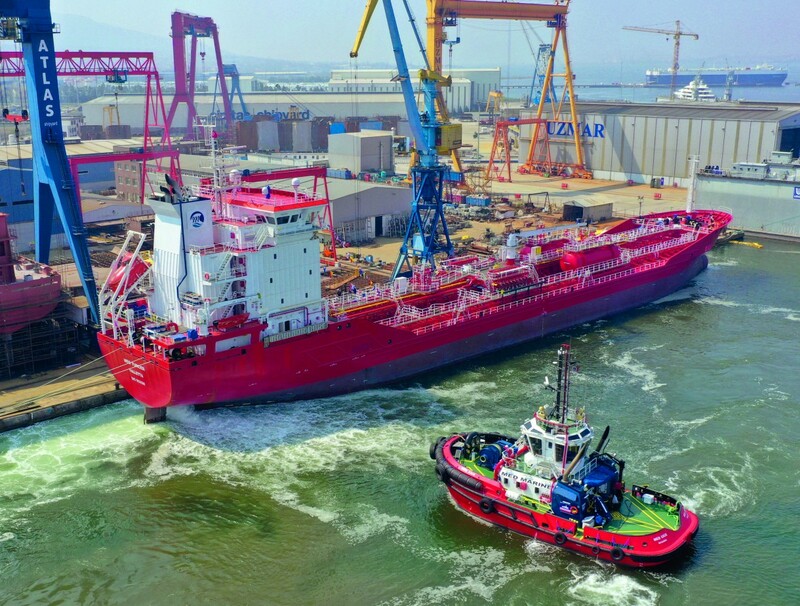 The vessel is a single screw, double hull vessel, which is capable of carrying large range of liquid cargoes, petroleum products and vegetable oils. Cargo area is divided to 12 cargo tanks by means of oil-tight corrugated transverse bulkheads and longitudinal bulkhead in CL. The vessel is also equipped with 2 slop tanks on deck. Designation of full segregation gives the vessel high flexibility. Marineline cargo tank coating has been applied to all cargo tanks.